Pneumatics are not essential, but they will save a lot of time. Tis’ the season to be working on bee-ware. Given the bad weather I took the opportunity to get some inside work done. I caught up on some back episodes of The-Self-Sufficient Gardener Podcast which was nice. The episode on Potatoes made me think of some parallels between the Irish Potato Famine and our current trials and tribulations with bees. I will save that for a later post. Instructions on frame construction have been done to death, and this guy from Australia’s video is good enough that I am not going to try duplicate it. 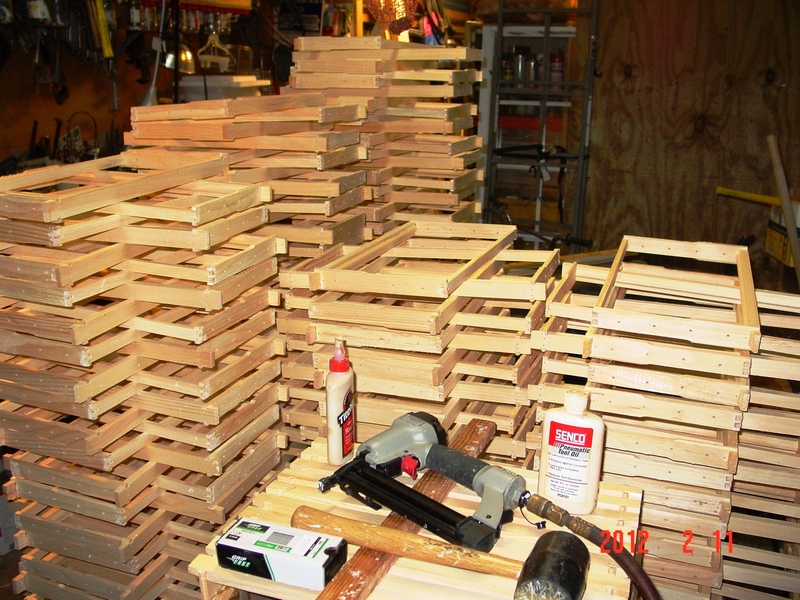 I use the same methods except I use a Brad Nailer with 18G brads, and I DO NOT put foundation in the frames. My feeling is that bees should know how to build their own comb. I will take the time to point out one particular aspect of frame construction that I feel needs mentioning for any NewBees reading this. There are two nails that MUST be put into the frame, one on each end. 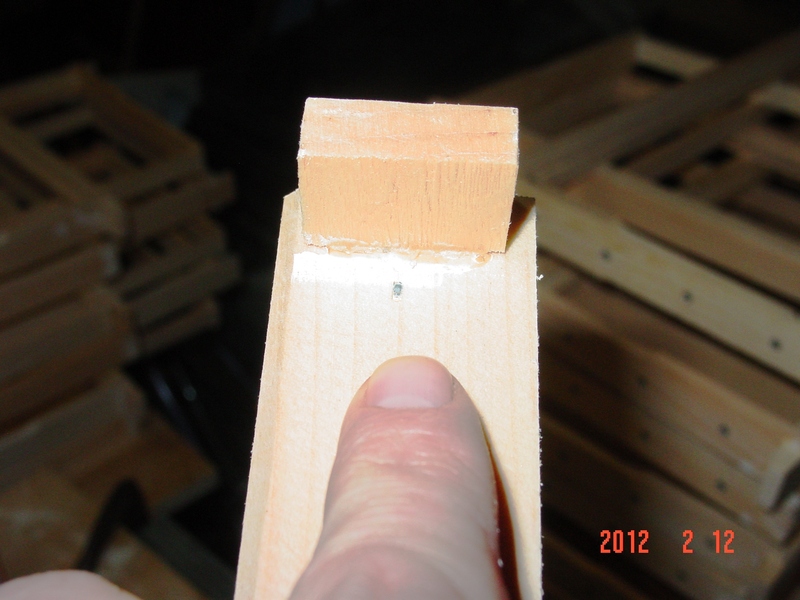 This nail will keep you from pulling the top of the frame off once the bees glue everything together inside the box. I learned this the hard way when I purchased my initial two hives. This step had been neglected on some of the frames by the previous beekeeper. When a deep frame comes apart full of capped honey, pollen and brood first you will curse, then you will wonder “What do I do NOW?! ?” Then you will curse some more. So don’t forget or be lazy. After all of my frames have had the eyelets inserted and are wired I will apply wax to the top bars. I have video on YouTube showing this from back in September 2011. The waxed frames will go in my swarm traps. The rest will be held back and used when it comes time for hiving the trapped swarms. I will have a post later this spring explaining that procedure. If you have bee-ware setting around unassembled get on the ball. The bee season will soon be upon us. This entry was posted in HowTo, Posts, What's going on.. and tagged beekeeping, foundationless frames, Indiana beekepeing, Jason Bruns. Bookmark the permalink. How have you been able to get the girls to draw comb without foundation? I have tried to get them to do this, even with a wax starter strip, but have been unsuccessful. Thank you. I have tried it several different ways and only one way has given me bad results. 1. I won’t be doing this in the future because I am no longer going to rotate boxes in the spring, but it does work. Last spring I rotated the boxes in April. Then I removed every other frame and put the foundationless frames between each drawn out piece of comb in the empty box (top box after rotation). It worked well. They drew it out perfectly. 3. The final way that I was able to get them to do it was a total change on normal beekeeping convention. I figured this out on accident. I caught a massive swarm that was on the ground. I finally decided I could not get it all in one box. I had 1 drawn out comb and the rest foundationless frames. The drawn out piece of comb was in the top box. They began building from top down as bees do in a tree. They then went down into the lower box and built their combs in the same PLANE as in the upper box. The frames in the bottom box didn’t even have wax or a starter strip or anything on them. I will be utilizing this in the future (and yes showing it in a future post). The way that HAS NOT WORKED is to place an empty box filled with foundationless frames on top of a box that is running out of room. The bees just seem to act as if they don’t get it. I have one box where they built their comb perpendicular to the frames and the comb in the bottom box. Not sure what I am going to do with that mess this summer. Those are my only experiences. Thanks for taking a look at my blog. Excellent! I guess the trick is to have drawn out comb. That is what we didn’t do. We tried putting just frames with the wax starter strips, and the results weren’t good. They just seemed to ignore those fresh frames. I liked the idea in your video of painting the wax on the frame top bar as a “starter strip”. I can see many applications of your wax painting idea. For example on fresh equipment to give the new hive a more homey bee smell since they are very sensitive to odors. Looking forward to whatever ideas you might have. I haven’t actually done this, but I think one approach that may work would be to break down and use some foundation on half of the frames the box. Then sandwich the foundation-less frames between them. I have 10-12 pieces of deep foundation. If I get a swarm call this spring and don’t have any drawn combs left I will be trying that. I will keep you posted on my results. On the starter strip, I have been told by some people that it is not needed. I don’t know for sure if that is accurate or not. I will be testing that this spring and summer too. You cannot be afraid to experiment a little. The way I look at it, if I am not exploiting the bees by trying something new I proceed. Funny, I have thinking about experimentation with the bees after I recently read Ormond and Harry Aebi’s books on beekeeping. In one of the books, they even have a fascinating chapter on some of the experiments that they did. Langstroth, Warre and Francois Huber as well as many many other beekeepers obtained a lot of knowledge by simple experimentation and observation. I don’t understand some of the questions people ask and some of the answers on forums that I follow. It is as if they are afraid to do anything and face the consequences. They are always looking for an expert. I believe in experts about as much as I do the tooth fairy. If there was any such person we wouldn’t be having the problems that we are facing with bees. The expert would have already saved the day long ago. Luckily we have the internet and there are some people making some headway. By networking and experimenting we may just be able to get somewhere. The gentleman you know that is using follower boards is one such example. Those boards are something that was done in the time of Langstroth. I will be experimenting with them in 3 of my hives this year. Dont’ be afraid of failing every once in a while….. Yes, its the beekeeper experimenters that I find fascinating. I’ll be seeing my teacher, follower board guy, in a couple weeks at a bee symposium. He’ll be talking about new stuff. Would love to share beekeeping results with you. Please keep sharing on this blog.